Route 50 to Easton. Exit onto Route 322. Follow signs to St. Michaels, Route 33. Upon entering St. Michaels, turn right onto Seymour Ave. Turn left onto Riverview Ter. Point Breeze is on left at end. 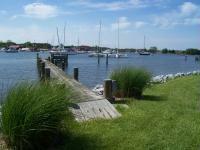 Point Breeze B & B is a welcoming waterfront bed and breakfast in historic St. Michaels, MD. This gracious family home with 400' of harbor-side waterfront offers a residential Bed & Breakfast experience not to be missed. The understated elegance, achieved by decorating with five generations of family treasures, creates a home of comfortable relaxation. However, the necessary attention to detail is not overlooked, and your hostess' Southern hospitality is warm and welcoming. Her concierge service will enrich your visit with local information, suggestions and reservations. The charming first floor bedrooms afford you personal attention and privacy, while several common areas encourage visiting. Delicious breakfasts overlooking the water, complimentary bicycles and kayaks further enhance your stay. A few extra amenities may make your stay more enjoyable. Wireless internet access is available for your laptop, and there are games, puzzles, movies and books for your entertainment. Outside enjoy complimentary use of bicycles, kayaks, and a canoe. We can set up badminton, croquet and Yolf. Would you like to try your hand at crabbing? Instructions, supplies and ''chicken necks'' are available. After a busy day of exploring the many things to do in and around St. Michaels, come home to the relaxing, comfortable elegance that is Point Breeze. You'll be glad you did!